News in overnight of a major price price cut on Trinity’s 49.07m motor yacht Blind Date, a joint listing with Merle Wood and John Cohen at Merle Wood & Associates. One of the newest Trinity 161s, Blind Date was built in 2009 and received a Judges’ Special Commendation at the 2010 World Superyacht Awards for her innovative layout and build quality. She accommodates 12 guests in five cabins, and features a stunning forward-facing, split-level owner’s suite on the main deck with a private lounge, his and her bathrooms and excellent storage facilities. The elegantly appointed guest accommodation is housed on the lower deck in three double cabins (one with Pullman), and one twin cabin (with Pullman), which can be converted to a double. 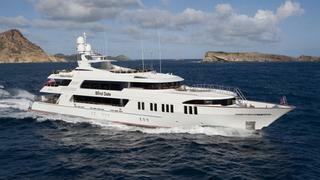 Currently in the Caribbean, Blind Date is now down from $27.9 million to $25.9 million.